The central philosophy of Mana Lomi® is that each person is equally Divine in every aspect: body, mind & soul. The concept of evaluating the constitution of the whole person and finding the imbalance, allows the lomi practitioner to look at each patient as a unique individual. The National Certification Board approves Dr. Maka’ala Yates and Mana Lomi for Therapeutic Massage and Bodywork (NCBTMB) as a continuing education provider. Advanced problem solving lomi techniques, which focuses on the concept of prolonged compression and traction at the musculotendinous junction. A brief understanding of the relationship between the muscle spindle fibers, the golgi tendon organ (gto) and the pain receptors. Possibilities for problem- solving advanced physical maladies. Use of hot towels for chronic and acute conditions. Kumukahi concept of achieving positive outcomes. The importance of how to communicate through soft tissues down to the bones. The importance of the SI joint protocol. This form of lomilomi focuses on problem solving physical maladies. ML is based on Maka’ala’s years of clinical experiences using traditional lomilomi as taught to him from his lineage of Hawaiian healers. The relationship between the Golgi Tendon Organ (GTO), muscle spindle fibers and pain receptors and how they are key in Mana Lomi treatments. 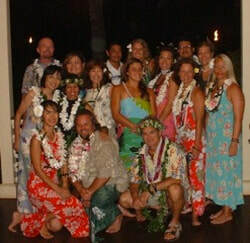 This class incorporates ML level 1 (cllinical lomi), level 2 (advance procedures), and level 3 techniques uniquely designed for lomi papahele. You will learn how to transition all three levels into your work and how to problem solve simple physical maladies with ease. Lomi Papahele not only teaches how to use your foot, hands, knees, forearms, and a straight lomi stick on a fully clothed client. This training goes beyond the laying of stones onto the patient. It is specific to the individual’s needs and focuses on problem solving! Learn how to use hot stones in the treatment of physical ailments, while promoting relaxation and recovery. Each student will learn the importance of the transitional use of hot stones. We will explore how stones combined with the Hawaiian healing philosophies can be spiritually inspiring as well as effective with long-term results. Healing self-care approaches for the therapist will be covered that allow deeper work with less demand on the practitioner. Each student will learn how to collect stones using proper protocols, how to heat the stones control the temperature, and how to clean the stones. Therapists will be trained in the art of double sheet, body wrapping using a unique blend of Polynesian herbs that detoxify the body, nourish the skin and induce relaxation. The importance of correct heat application for a long-lasting and deeply therapeutic session will be covered. You will also learn how to incorporate Mana Lomi problem-solving techniques into the session using specific herbs and oils. To release and cut (‘oki) the energetic cord(s) with a person, place or thing. Restore balance (kaulike), harmony (lokahi), and tranquility (maluhia) within and outside the self. Manifesting healing for yourself and others. Herbal formulations: colon powder and anti-parasite tincture (enough for 1½ months). Flushing the digestive system with a seawater formulation. 60-Day cleansing guide: A primer for healthy living. Private consultation with Dr. Yates with the use of his iridology camera. This full 15 day intensive program is designed for those that want to accelerate the learning process of Hawaiian healing, especially using Mana Lomi®. This intensive training is held only once per year in Hawaii.l The maximum number of students is limited to 12 so that an ideal student to teacher (or assistant) ratio can be achieved. It is truly a life-changing experience. Clinical procedures & techniques of problem- solving lomi. History of lomi & Hawaiian healing chants. You will learn an effective, 60-90 minute full body sequence to help bring relief to many physical maladies. Advance lomi techniques including three main protocols to problem solve difficult physical problems. Compression/traction at the musculotendinous joint is the focus. Hot stone therapy. This training is more than just laying of stones onto the client. It is specific to the individual’s needs and it focuses on transitions! Lomi Papahele – Floor lomi-Teaches how to use the combination of foot, hands, knees, forearms and two kinds of lomi sticks on a fully clothed client. Ocean ceremony in the morning. How to eliminate the “onion” entirely. Four simple steps of cutting the unwanted energetic cords or emotional and non-emotional memories. Reflex mechanisms of the large and small intestines to the body. Castor oil and the piko. Specific organs with specific techniques that are non-invasive.